What I Did on My Holidays. 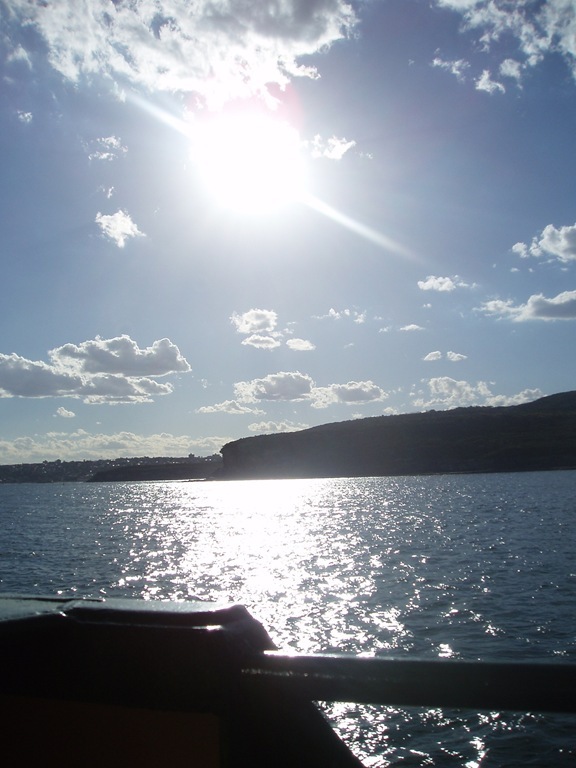 Part 5 – Sydney, Canberra, and …’home’? Alright, a gentle recap if you will. We’ve followed me out of Brisbane, south through the air in a magic flying train to Adelaide, west via cars and koalas and hobo tuna sandwiches to Melbourne, across the world’s most perfect park bench, and onto a train. We’ve tracked the train across Adelaide, across a thumping 227 from Kevin Pietersen, and through into the Nullabor plains, and the ghost town of Cook. We’ve watched the red dust and the dead scrub fly past the windows, hour after hour as I went gently mad, until I wound up in Perth, the most isolated city in the world (you may have gathered by now that this is one of my favourite statistics). And then, we’ve watched me turn around after a mere day in Western Australia, and we’ve tracked me back, back past uncounted, unseen emus in probable droves. And we left me as, having passed through Adelaide for the third time, I penetrated the time-zone membrane of New South Wales, and made my way towards Sydney. 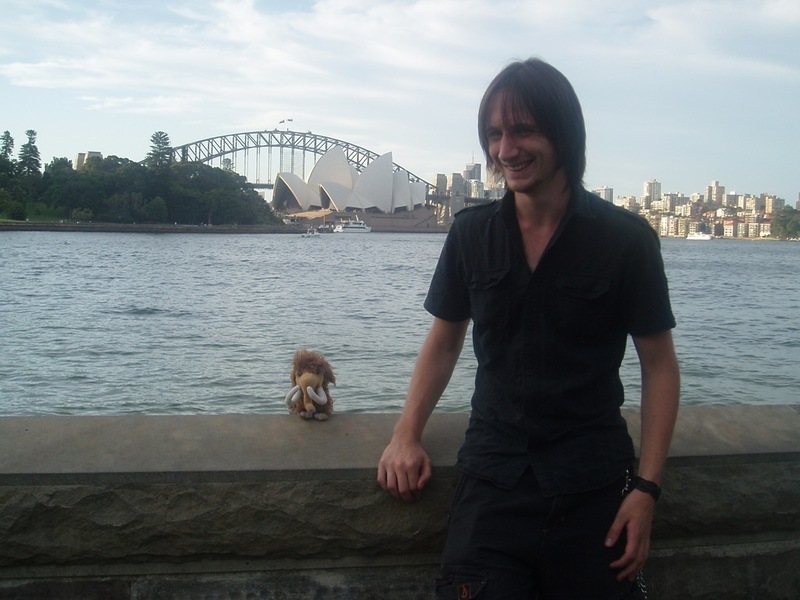 11th December 2010, New South Wales. Bus between Parkes and Sydney on account of track flooding. My hands stink of McSoap. This sounds like an incredibly trite piece of cultural criticism, but it’s just a fact. McDonald’s soap pongs. Track flooding? Yep. As we approached the famously scenic Blue Mountains National Park, word came back that the tracks in NSW were unusable, and our journey was going to finish with a six-hour bus trek, leaving to a much later arrival than planned. Though my first reaction to this was along the lines of oh Jesuses not more vehicles, it actually worked out pretty nicely. The Blue Mountains are one of Australia’s most famous regions of gorgeousness (in a country not exactly shy of being beautiful), and a gentle bus tour through the eucalypt-hazed peaks and valleys wasn’t a bad way to spend a morning at all. And then, after a stop at the aforementioned Maccy Dees, it was downhill, and east—into Sydney. And there we have ‘em – the pictures that, let’s face it, all of this has been effectively leading up to. 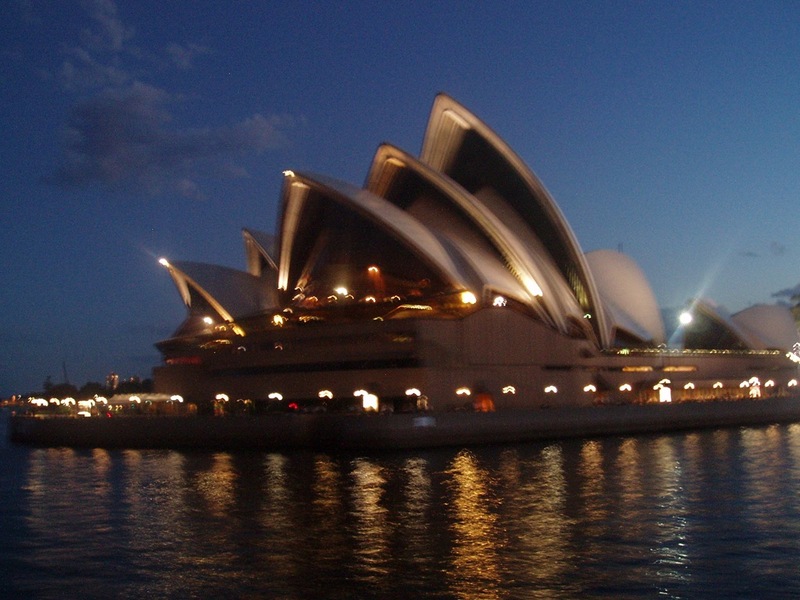 Opera House, Harbour Bridge. Boom, boom. Sydney Harbour, Manly Ferry, Chinatown, beaches, street performers, markets, bustle. Boom. Sydney was, of course, stunning. It was also large – I’d anticipated a “big city” vibe on the scale of Melbourne, but no. This was a different kind of beast altogether. Just the central district ate up an entire day as I walked around it, from Darling harbour to the west, along the waterfront to Circular Quay, Harbour Bridge, the Opera House, and out to Mrs Macquarie’s Chair. It’s a tourist city, too; didgeridoo players and jugglers line the wharves, haggling for the tourist dollar. Slightly annoyingly, the Opera House forecourt was closed off for the day as they were preparing for the visit of Oprah Winfrey, who apparently was going to do a thingy there. But never mind her, it wasn’t as though I was short of entertainments. My hostel was a dive, but the people in my room were all good banter, and a bed for the night is a bed. Next day I awoke with no particular ambitions, but I was well-armed with a tourist map and a finely-tuned gawp, so I set out. I wandered first through Paddy’s Markets, a sort of giant Asian-themed car boot sale set in a ginormous building near the Chinatown, and then walked back across the centre to the building pictured above right: the Art Gallery of New South Wales. This was a pretty spectacular choice; not only was the collection fantastic, but I was seized on by an overwhelmingly enthusiastic volunteer guide named Dianne, who was so delighted to have someone actually ask her a question that she effectively gave me a 45 minute tour of her own favourite paintings, all the while describing their relation to her own thesis on geometric abstraction. 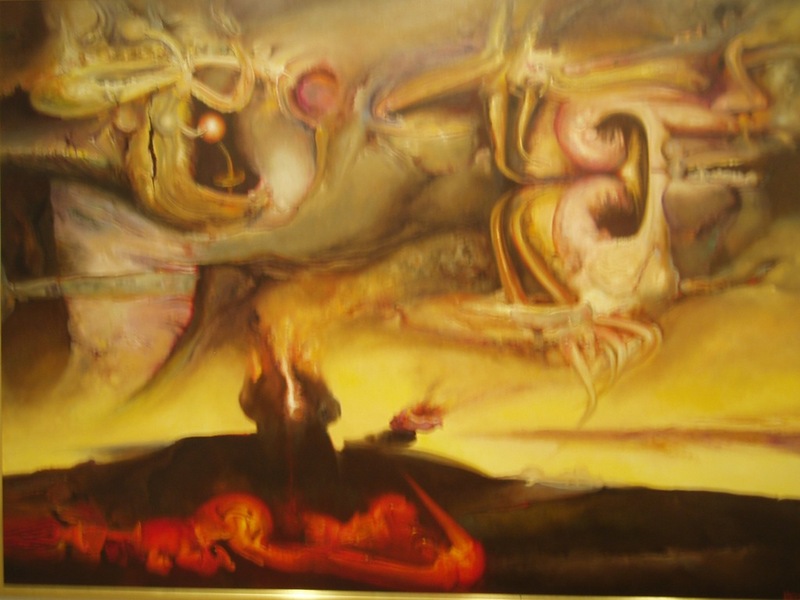 It was a lot of fun to listen to her burble on, but it was after she’d departed that I wandered across a painting which I absolutely fell in love with: “Sunset in a Subduction Zone” by James Gleeson. If anyone feels like getting me a belated Christmas present, this’ll do nicely, thanks. No need to wrap it up. Finally, on Soraya’s recommendation, I took a ferry out to Manly. 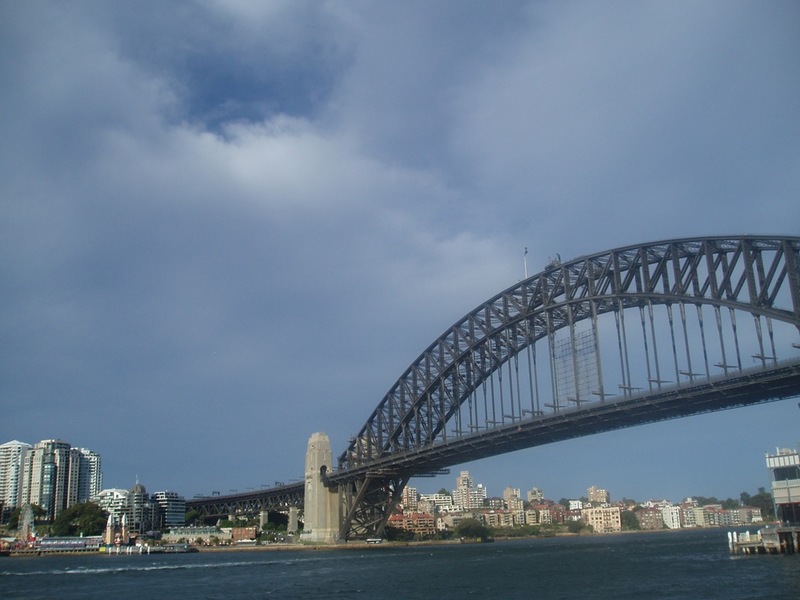 Sydney harbour is a huge and convoluted estuary, which Sydney actually sits quite a long way inside. 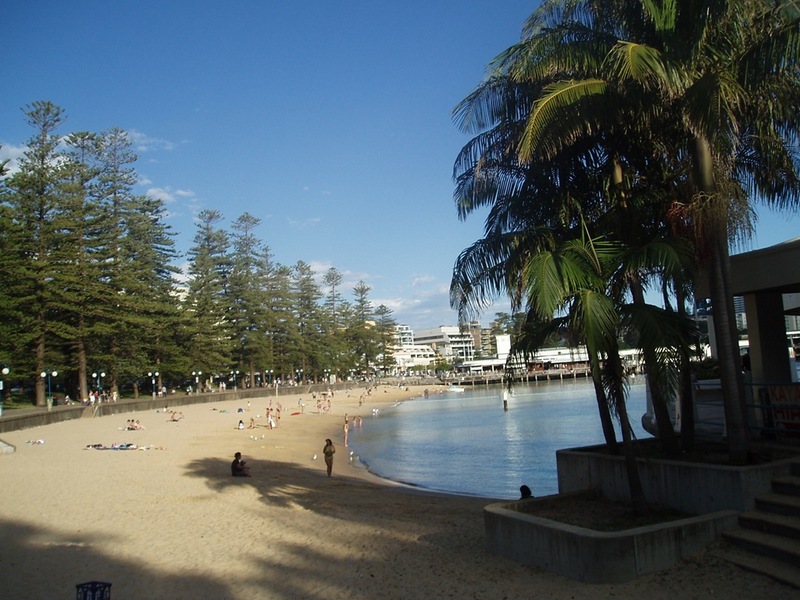 To get out to the pacific itself, you have to get out to somewhere like Manly, a little town situated right on the final headland between harbour and ocean. The half-hour ferry journey was exquisite, as was the place; situated as it was on a claw-shaped peninsula, it offered both a sheltered lagoon beach and a broad stretch of pacific sand, with just a couple of streets of fountain-lined streets in between them. Unlike some other beachey-places, though, it felt like the tourists were balanced out by actual residents, giving it a much more sedate pace and down-home vibe. If anyone ever fancies a weeked of unadulterated chill, I recommend Manly wholeheartedly (how you afford the ticket is, I’m afraid, your own concern). And then I was off! Off again, to Canberra, the capital of this vast and varied nation. Part of the reason I wanted to go to Canberra was because, well, nobody else does. Discuss somebody’s backpacking trail with them, and they’ll throw out Perth, Darwin, Sydney, Byron Bay – but never Canberra. No-one actually goes to the country’s headquarters. When I got there, although it was completely beautiful, I could kind of see why. Canberra seems to me a strange dichotomy. It’s exquisite…yet sort of dead. It’s a pressed flower. Don’t get me wrong, I thoroughly enjoyed my day there, and I’m definitely glad I went. But…it was a little odd. A little too geometric, maybe. Overperfect. 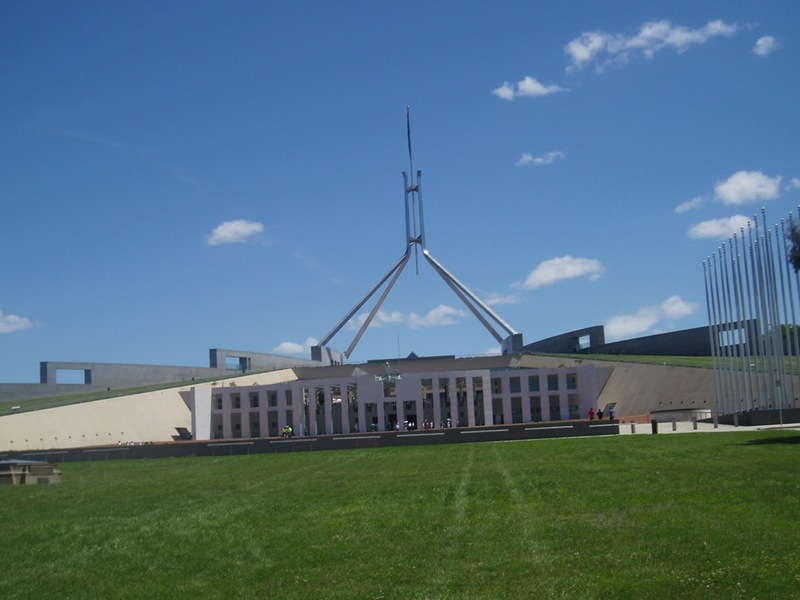 Canberra was designed as a capital city, and it shows. There’s nothing organic, everything is arranged with geometric precision. 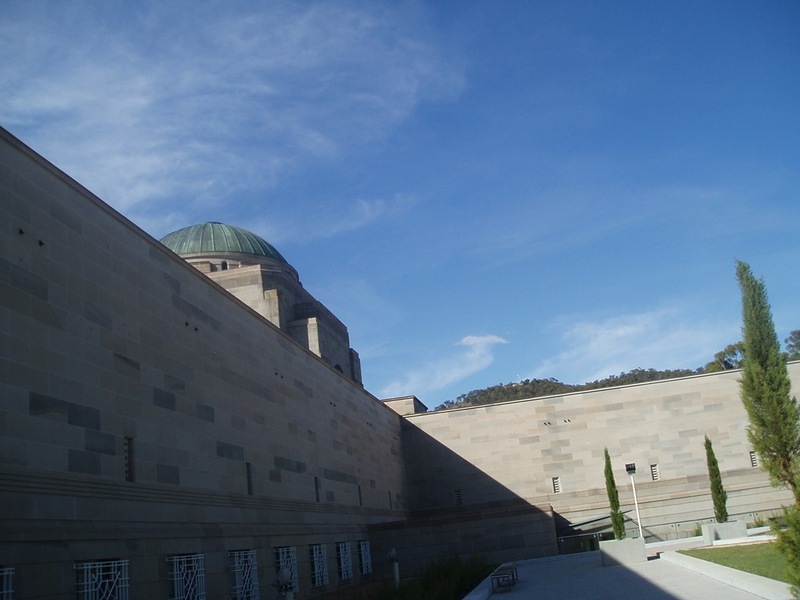 A triangle of central boulevards features the parliament house at its apex. The two axes heading away from (or towards) this apex cross a magnificent lake on long bridges. The lake itself is manufactured; created by a dam in order to match the architect’s vision. The result is a near-unwalkable city. I walked it, but only because I had a day in which I didn’t plan on doing anything else. If you lived there, you’d have to drive everywhere – the thing with huge sweeping boulevards, no matter how many inspirational war memorials line their edges, is that they’re big. And a city built for cars is, to me, a little like no city at all. Pristine, but a little low on soul. The attractions reflected this, too. 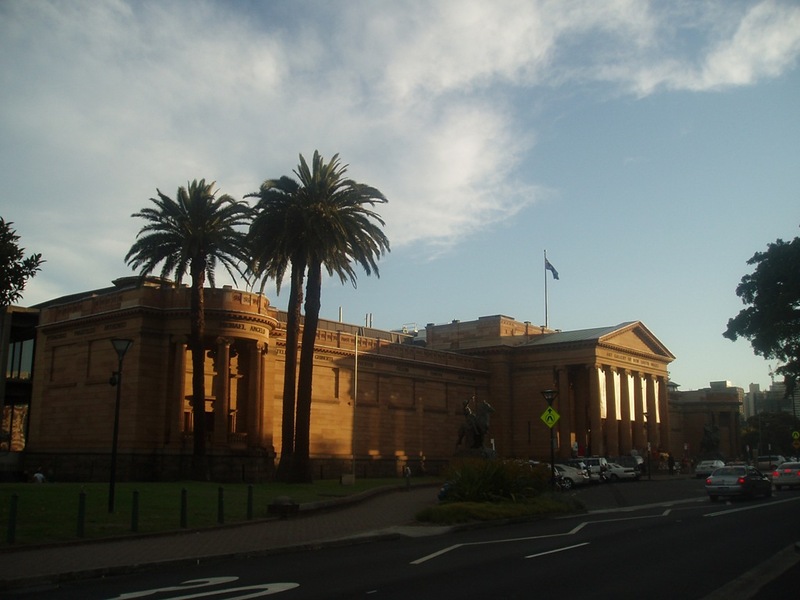 The Art Gallery of Australia was a case in point. The collection was incredible; Picasso to Pollock to Matisse to Duchamp, and on and on. They had Dali’s “Lobster Telephone”, which gave me little shivers of delight. But…I was one of only three people on the whole floor. The NSW gallery, by contrast, had been bustling and alive. They should move Canberra’s collection there. Magritte and Kandinsky, one would imagine, would prefer it if their pictures got looked at. And so; I’d done Adelaide. Done the Great Ocean Road, Melbourne, the Indian-Pacific, Perth. Seen the Blue Mountains, seen Sydney. Cairns, Darwin and Alice Springs remain unglimpsed (as does Tasmania), but they weren’t on this trip’s itinerary. Seen Canberra. Nothing much for it, then, but to take my weary legs and bleeding feet on back to Brisbane. I had another afternoon in Sydney in transit back to Brisbane, in which I sat in a coffee shop scribbling a sudden head-rush of ideas into my notebook, and then went and ogled “Sunset in a Subduction Zone” again for a bit. And then, travels came to an end. I slinked onto the 16:12 overnight XPT to Brisbane, and sat down to be delivered back. But I’m not trying to draw any significant conclusions for that, or complain. Complaining is the last thing on my mind; this is an account, after all, of some of the most stimulating, exciting, wonderful things I’ve ever done. Some of the most intense beauty–and on the Nullabor, most intense desolation—I’ve yet encountered in this stubby-legged little life of mine. It was absolutely, indisputably glorious. And Brisbane, a beautiful place all by itself, is if nothing else where my bed, and my shower, and my washing machine are. And after two weeks in trains and hostels, I really needed that bed. nice journey! I’m glad we went to Canberra.